LOUISVILLE, Ky. - Cincinnati Reds management and fans didn't really know what they were getting when they inked hard throwing, left-handed phenom Aroldis Chapman to a six-year, 30-million dollar deal in January. While it still remains to be seen how effective of a career Chapman will have, it seems that the rest of his 2010 campaign will be spent pitching out of the bullpen, a task he has taken to nicely since switching over from starting duties in late June. Chapman, who has spent the entire season with the Louisville Bats, began the year as a starter, going 5-5 with a 4.11 ERA in 13 starts. After exploding on the scene in April with a dynamite debut month in which he posted a 1.29 ERA, Chapman regressed during May and June. Although Chapman was striking out batters at a high rate and consistently hitting over 100 on the radar gun, he struggled with his control and saw his ERA balloon to over five in each month. With the Reds already stacked with several capable starting pitchers but needing some help out of the bullpen, the team's brass decided to move Chapman to a relief role at midseason, and he has responded with outstanding play. 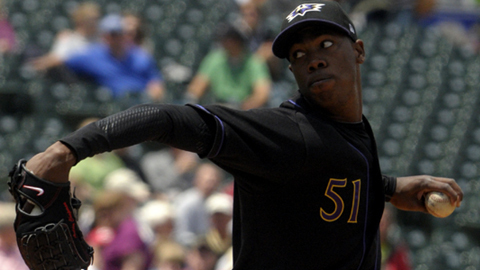 Whether the 22-year-old Chapman's success can be attributed to the change in routine, or just his continued acclimation to American professional baseball, there's no denying his production during the Bats' recent surge in the standings. Through the team's 22-6 July run, Chapman was 2-0 with a 2.25 ERA and 17 strikeouts in 12 innings. Since the calendar has turned to August, Chapman has been instrumental in the Bats catapulting to the top of the wild card standings, earning five saves and posting a 1.93 ERA, while registering 16 strikeouts in 9.1 innings. Overall, since starting his time in the bullpen, Chapman has posted a 3-1 mark with a 2.77 ERA and seven saves in 22 appearances. In 26 innings on the mound in relief, Chapman has registered 41 punch outs, while allowing opponents to hit just .158. Chapman's solid play in the bullpen, combined with the performances of fellow relievers Jared Burton, Enerio Del Rosario, and Daniel Ray Herrera, have given the Bats some quality late-inning pitching that has helped spring the team to the forefront of the International League wild card race. For the season, Chapman's numbers appear modest (8-6, 3.73), but are a microcosm of the up-and-down performance he has shown. Although he leads the team and ranks sixth in the league with 117 strikeouts, he is also tops on the club and fourth in the IL with 52 walks. If the last few months are any indication, however, Chapman could be starting to put it all together. The southpaw's potential is endless, as his fastball, which shows lots of movement, has topped out at 103 on several occasions. Whether Chapman's future is out of the bullpen or back as a starter where he has been through most of his career, the Reds hope he continues to develop his repertoire of pitches and proves to be worth their substantial investment.